Spend a wonderful time in our east Lyon hotel, right next to Eurexpo! 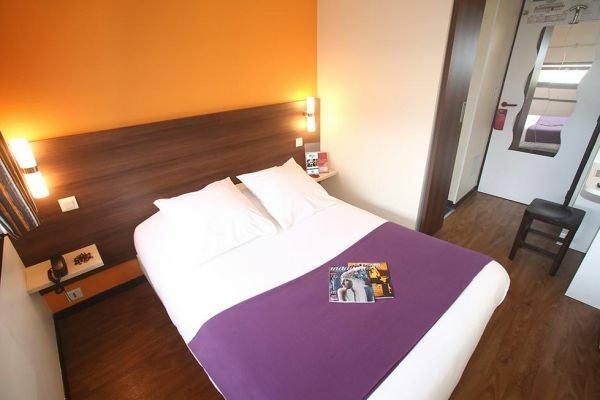 The Brit Hotel Lyon Eurexpo is ideally located and welcomes you in a warm atmosphere! The reception of our hotel is open from 7 a.m. to 11 p.m. If you plan to arrive later, an automated machine enables you to pick up your room key. A luggage storage service is available at the reception. Your car will be safe in our free private parking. Choose from our 50 air-conditioned rooms. Double or twin rooms in “standard” or “comfort” styles, pick the option that fits your needs! Each room of the Brit Hotel Lyon Eurexpo has all the necessary equipment you need for a nice stay: a private bathroom with a hair dryer, a telephone and free Wi-Fi. Sports and cinema fans will appreciate a flat screen TV with Canal +. Wake up to delicious food! Our generous and fresh breakfast buffet is just what you need to start the day properly. Have lunch or dinner in one of the many restaurants near our hotel. Our staff will happily give you advices on the best places around! After a long day at work or spent visiting Lyon, relax in our TV lounge or at the bar and enjoy our terrace. Why wait? Book your stay in our hotel in Lyon right away! Overall good stay. 2 things to improve in my view: the room could do with a chair instead of a stool and the sink is just too small so very impractical.